No man is an island and on the digital ocean no site can survive and thrive in isolation. For your site to do well you need to build up a tribe of followers, people who are interested in what you have to say and will help amplify your voice and message further than you could alone. For this to happen you need to build relationships or allegiances with others online and ultimately content is the conduit for the connections that you’ll need for your site to succeed. This post is brought to you by years of experience with content marketing, and in part, by the letter C, so read on! The first thing to consider here is what is the purpose of the content and who are you writing it for? Sometimes content creation may have an overly SEO focus, sometimes it might be an attempt for viral glory, sometimes it might be a resource or roundup driven or sometimes it may be to generate connections but, unfortunately, content will rarely tick all those boxes (oh but when it does!. And so, before starting to write the post think about a central focus or objective for the post. For example this post about WordPress malware removal was an SEO play, this post featuring Rebekah Radice was the help deepen the connection there and re-purpose content and this SEO Expert joke was a failed attempt at going viral (sigh) but each piece of content had a purpose that it was crafted for. So, now that we’re starting to view content as specific little worker drones of sorts, each with their own purpose, we can start to consider how best to seed or amplify content. There is an element of what came first here, the chicken or the egg, but if you can identify those in your niche that you want to connect with and then try get on their radar you’ll be giving your content a better chance of being spotted, seen and shared. For example, in this post about Google Plus serendipity, I discuss how I was fortunate enough to get on the radar of Martin Shervington, one of the best known power users of Google Plus. If you check out the post you’ll see some of the steps which were consciously taken to create a platform to cultivate the connection (gotta love that yellow banana!). This post on the differences between Google Publisher And Authorship helped me get on the radar of Mark Traphagen, someone I’ve learned a lot from, and then in turn went on to get almost 2,000 shares which shows the importance of creating good connections with your peers. Your approach to how you cultivate connections should be one that is unique to you, that sets a tone that you want, that creates a perception you want for your brand – personal or otherwise – and, ultimately, an approach that is honest so it can be replicated time and time again! Which leads me to the next point about content and connections and one that you avid readers will know that I’ve failed miserably at…kind of. Momentum is mass times velocity and for your online business to succeed momentum is key. 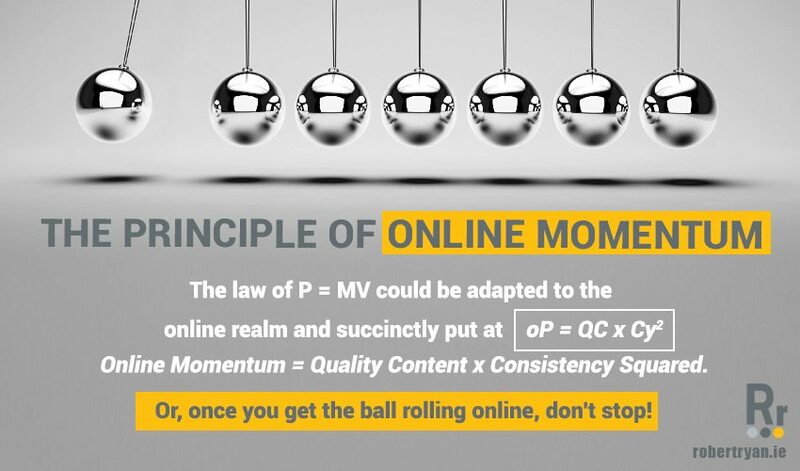 The physical principle of P = MV could be adapted to the online realm and succinctly put at oP = QC x Cy2, Online Momentum = Quality Content x Consistency Squared. Once you get the ball rolling online it’s key that you don’t stop. Like Sisyphus and his struggles with the boulder you can’t stop pushing. You should publish new content consistently (I’d recommend once a week at a minimum) and whatever you don’t do something like I did with the No Blogging Experiment! Concurrently you should look to continually expand your social footprint by finding new places of seeding your content, new related communities/groups/forums of people who might appreciate what you publish and new influencers in your niche so you can try get on their radar. Have the mindset of iterate and improve and each time try to leap frog what you achieved before. 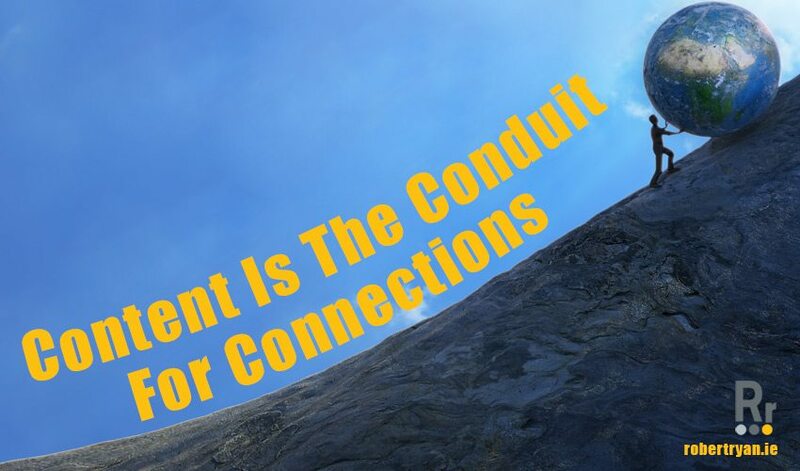 Content Is The Conduit For Connections – So What? Posting regular content and building connections isn’t just done for the sake of doing it, it is done to generate sales. As mentioned at the start, all content should be crafted with a specific focus in mind and tailored to that end. Without content, your online fodder for the social media circuit, you’ll be hamstrung in your efforts to generate new connections which in turn will lead to traffic which in turn will lead to sales. And isn’t that we all want? No Replies to "Content Is The Conduit For Connections"